Manistee News Advocate-Manistee Daily Advocate, (Manistee, Manistee, Michigan), 13 October 1927, page 3, column 2 and 3, microfilm; Manistee Public Library, Manistee, Michigan. 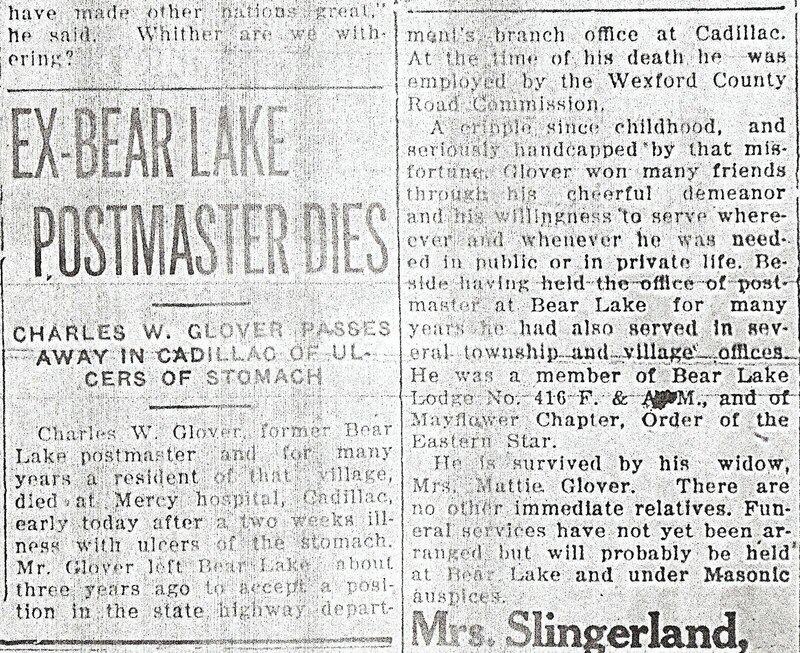 Charles W. Glover, former Bear Lake postmaster and for many years a resident of that village, died at Mercy hospital, Cadillac, early today after a two weeks illness with ulcers of the stomach. Mr. Glover left Bear Lake about three years ago to accept a position in the state highway department's branch office at Cadillac. 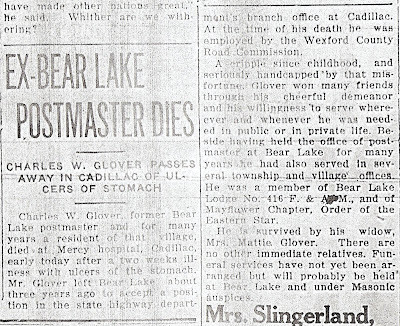 At the time of his death he was employed by the Wexford County Road Commission. A cripple since childhood, and seriously handcapped(sic) by that misfortune, Glover won many friends through his cheerful demeanor and his willingness to serve where-ever and whenever he was needed in public or in private life. Beside having held the office of postmaster at Bear Lake for many years he had also served in several township and village offices. He was a member of Bear Lake Lodge No. 416 F. and A. M., and of Mayflower Chapter, Order of the Eastern Star. He is survived by his widow, Mrs. Mattie Glover. There are no other immediate relatives. Funeral services have not yet been arranged but will probably be held at Bear Lake and under Masonic auspices. ﻿Manistee News Advocate-Manistee Daily Advocate, (Manistee, Manistee, Michigan), 15 October 1927, page 3, column 2, microfilm; Manistee County Historical Museum, Manistee, Michigan. 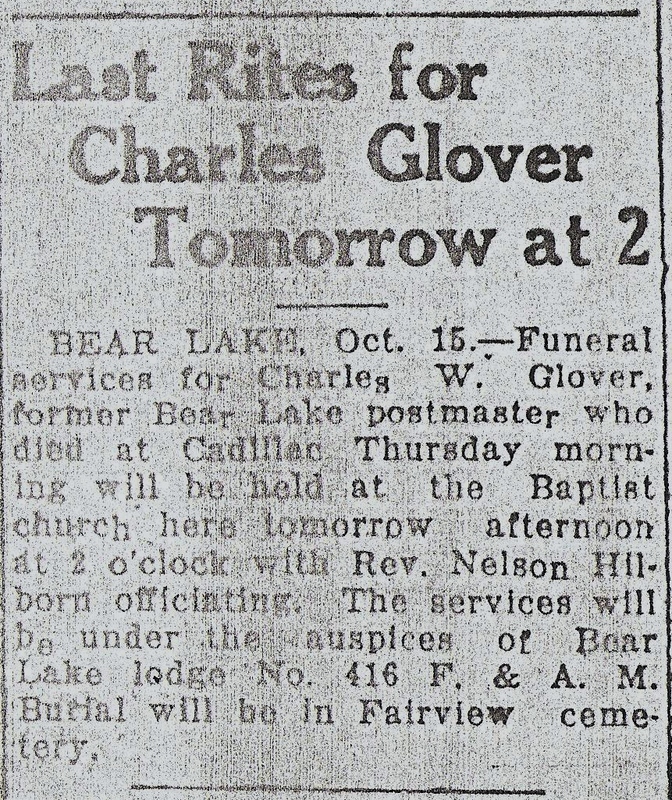 BEAR LAKE, Oct. 15-Funeral services for Charles W. Glover, former Bear Lake postmaster who died at Cadillac Thursday morning will be held at the Baptist church here tomorrow afternoon at 2 o'clock with Rev. Nelson Hilborn officiating. 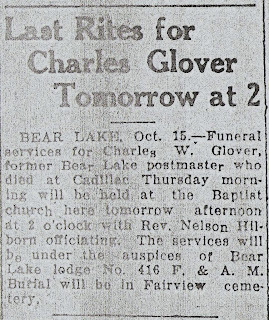 The services will be under the auspices of Bear Lake lodge No. 416 F. and A. M. Burial will be in Fairview cemetery. It is hard to believe the year is almost half over. I decided to check up on how I was doing with my 2011 goals so I could plan my summer genealogy projects and stay motivated. Scan pictures! This is going very well. There are always more pictures to scan. Work on my brickwall, Daniel Fenn. I worked on this for awhile, but put it aside as it frustrates me and I believe a visit to Vermont is needed. Make a concentrated effort to source every fact as I add it to my software program. This is one I am doing very well on; it doesn't go into my software without a source. Visit Miami County, Indiana to research Casper and Mary Graf further. I thought I would do this during the summer, but our summer seems to be filling up. I guess I will have to make this a priority in August. Obtain my grandfather's, Otto August Fredrick, obituary. Completed. Attend a genealogical conference. Almost completed, I am registered for FGS in September. Hope to see you there. Start researching my son-in-law's ancestry. Since I wrote 'start researching', this is completed. I have researched his father's side and am working on his mother's. Talk to my mother and find out about family heirlooms in her possession. Completed, now she brings me stuff she thinks I might like to have from my aunt and others. Carve out a regular research time. This is the one I still struggle with. I feel I could do better. I have been having some thyroid troubles which causes me to be unmotivated at times, so I will attribute it to that! Make contact with newly discovered cousins and share information. Continuing to do this, and hope to continue discovering more cousins. I feel very good about 8 of the 11 goals. Number 2, I know, will not be completed. Number 4 needs to be scheduled and then I will get it done. And, number 9 is one I think I will continue to struggle with, but as long as I keep researching I don't think it matters if I do it on a regular basis or not. This was my first year of setting goals. I have learned a lot. I think some of my goals were too general. I will set yearly goals again, as it truly motivates me and gives me a focus in my research. This isn't the only research I have done. So far 2011 has been a good genealogy year. Week 26: Songs. What was the #1 song during the week of your birth? Enter your birth date at This Day in Music (http://www.thisdayinmusic.com/birthdayno1) and find out. 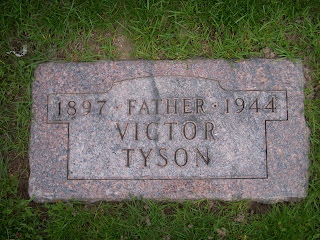 One month ago I visited Memorial Park Cemetery in Battle Creek, Michigan for the first time. 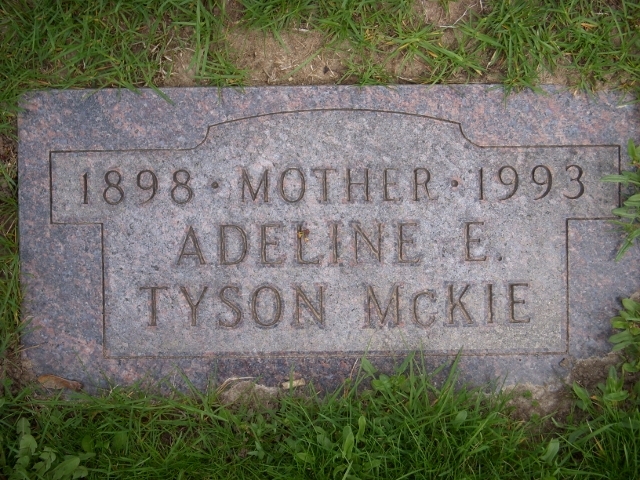 I was looking for the grave sites of my great aunt and uncle, Victor and Adeline (Glover) Tyson. I thought it was one of the most beautiful cemeteries I had ever visited. There are lots of trees, a lake, and a waterfall. There is a chapel mausoleum on the premises, too. Each section is marked with names, mostly garden related: Garden of Tranquility, Garden of Grace, Garden of Hope, Sunrise Garden, etc. I had checked the Memorial Park Cemetery website before going and printed off a map and the plot numbers for my ancestors. You can use the Burial Record Search for the names of those interred there. 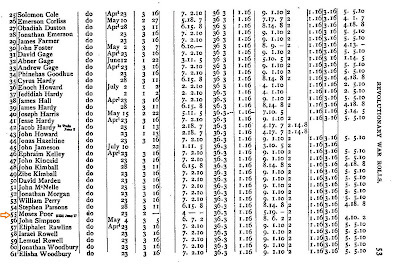 The search function provides the garden letter and plot number. You can access the map with all the gardens and their letters on the website by clicking the products and services tab, then the property pricing tab and the view map link. There is an office at the entrance on West Territorial Road and I stopped in to ask where I might find the plots, but could have done it on my own with the map I had. The very helpful women gave me a bigger map with all the plots laid out on it and circled the one I was looking for. It was a very easy cemetery to look through. I easily found what I was looking for and decided to drive through the cemetery. It is located on a very busy corner in Battle Creek, Michigan, (Helmer Road and W. Columbia Ave.) but you wouldn't know it. It was very peaceful and quiet. I loved all the huge trees. Imagine my dismay, after a recent storm, when I saw the mess left from the storm. Battle Creek, Michigan was hit with wind shears and tornadic swirls at a recent storm in late May. I was on my way to the Meijer grocery store, which is across the street from the cemetery, and saw so much damage to the cemetery I was in disbelief. Trees crashed into the fence, signs were blown into the cemetery from nearby businesses, and gravestones damaged. Luckily, my ancestors gravestones weren't damaged. Battle Creek is still cleaning up from the storm. Here are a few pictures of the damage to the cemetery. I am not sure the pictures truly depict the devastation to the back half of this cemetery. 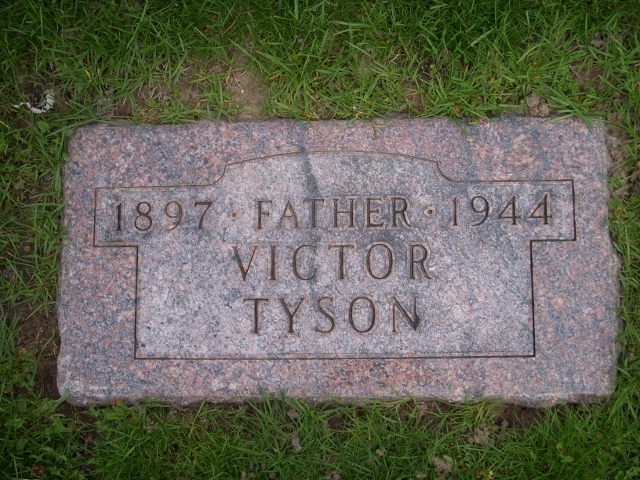 Burial: Memorial Park Cemetery, Battle Creek, Calhoun, Michigan. Week 25: Neighbors-Who were your childhood neighbors? Have you kept in touch with any of them? Do you feel the concept of 'neighbors' has changed since then? I grew up in two, small towns: one with a population of about 900 (Deckerville, Michigan) and the other with 2500 people (Harbor Beach, Michigan). Everyone knew everyone, which could be good or bad. Mostly though, it was good. In Deckerville, there were kids to play with across the street and down the block. We would go back and forth to each other's houses and play, usually outdoors. Sometimes we were allowed in the house to play. We played house, tag, jump rope, and baseball. I haven't kept in touch with any of my neighbors from there. I am still in touch with a couple of school friends who lived in the 'country' though. I was ten when we moved to Harbor Beach, Michigan and the first weekend we moved in I met the girl across the street, Sharlene. We became friends and reconnected on Facebook, recently. Another friend, Ann, lived across the creek from me. We would hang out at each other's houses. In high school, we use to double date. We have remained friends. I only have good memories of neighbors in both the small towns I lived in. We have lived in our current house about 20 years and I have noticed a change in those twenty years. At first, everyone was friendly and talked across the fence. I took my neighbor to the store if I was going and she shared fresh tomatoes with me. Lately, our neighborhood has had an influx of new, younger people. I find that the newer neighbors stay to themselves more. I think society has changed and people aren't as trusting as they use to be. I find I stay more to myself, too. We still chat with those who were here when we moved in and I always say 'hi' or wave to my neighbors. Of course, living in a city with a population of 55,000 is a little different from the 900 people from years ago. Bunker Hill Day is observed on June 17th each year in parts of Massachusetts. My fifth great grandfather, Moses Poor died at the Battle of Bunker Hill on June 17, 1775. He served under Captain Elisha Woodbury's Company in Colonel John Stark's regiment, the 1st New Hampshire. There is a Bunker Hill Monument that was built to commemorate the Battle of Bunker Hill. It can be found in Charlestown, Massachusetts. Moses Poor's name is inscribed on this monument. Moses Poor was born 10 March 1743 in Newbury, Essex, Massachusetts, the son of Enoch Poor and Bethiah West. He married Hannah Sinclair (Santclare) on 31 March 1767. He died at the age of 32. The 1st Regiment of the Engineers and Mechanics of Michigan was a civil war volunteer group of individuals that organized at Camp Owen in Marshall, Michigan, on 12 of September 1861. Marshall, Michigan was chosen because of its' proximity to the Michigan Central Railroad. In addition, it had a large fairgrounds where they set up camp. Camp Owen was named after John Owen, the state treasurer at the time. My second great grandfather, Samuel Stillman Glover, Jr. was in Company H of this regiment. 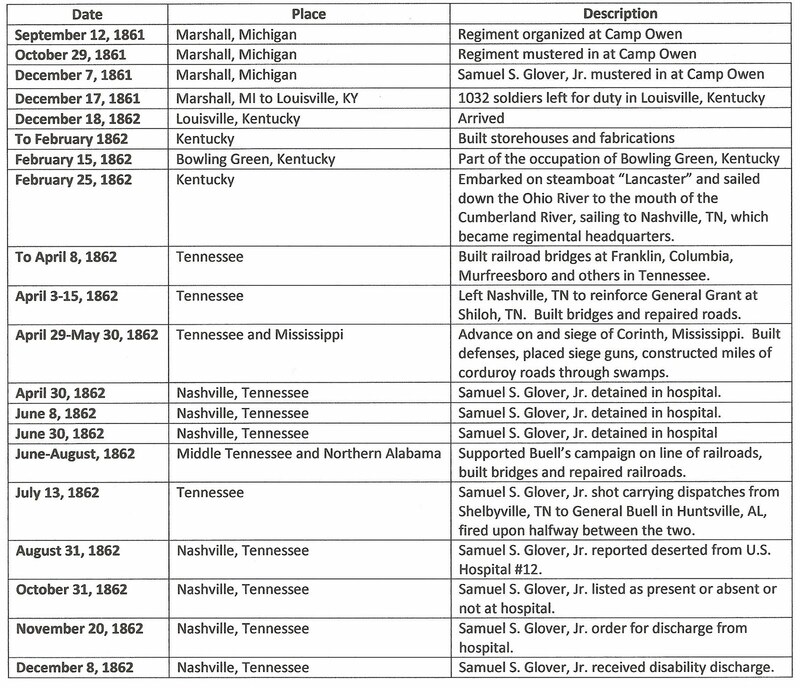 I have researched service records, pension files, and regimental papers to learn more about this regiments' service to the Union during the civil war, especially my ancestor's important dates. 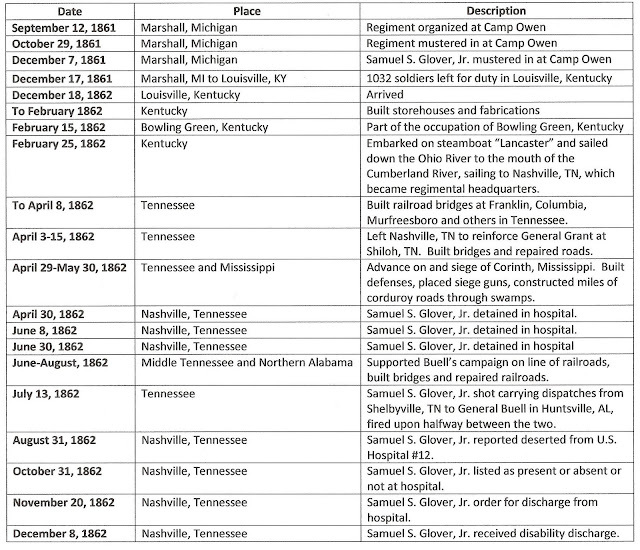 The information below gives specific times and duties of the members of Company H up to the time of Samuel S. Glover Jr.'s discharge. A couple of things struck me as interesting when I compiled this chart. First, what hard workers the engineers and mechanics must have been. Can you imagine building corduroy roads in a swamp? Next, on August 31, 1862 he was reported as deserted from U. S. Hospital #12. Deserted? Does this mean what I think it does? He received a pension, so I am guessing he returned with a suitable reason for not being there on that day. 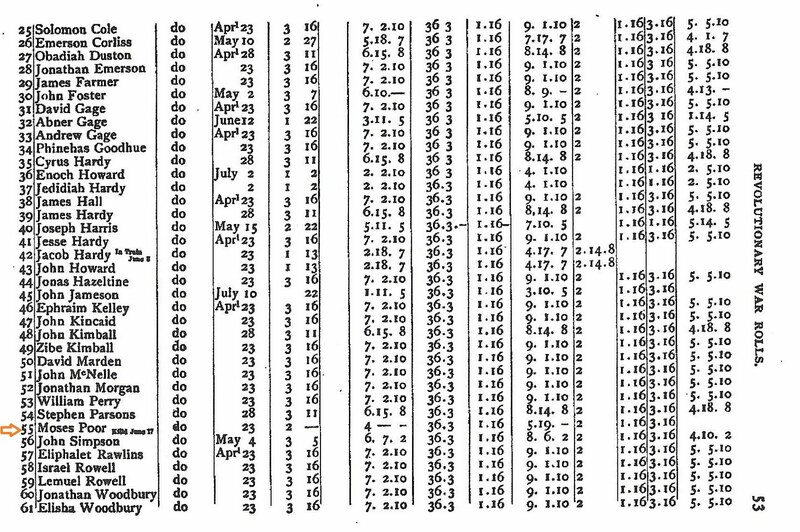 Lastly, I enjoyed reading the October 31, 1862 entry, he was listed as present or absent or not at hospital. I guess that is better than being listed as deceased. I wonder which one of the three he was! One of my sources is Mark Hoffman's book, My Brave Mechanics. At the May Calhoun County Genealogical Society meeting, held in Marshall, Michigan, Mr. Hoffman was the presenter. He gave a very informative talk on the role of the engineers and mechanics. If you would like more information on this regiment, his book is a well-sourced, excellent account of their service. I wrote about his book previously, and highly recommend it. Hoffman Mark, My Brave Mechanics: The First Michigan Engineers and Their Civil War (Detroit: Wayne State University Press, 2007). Sligh, Charles R., History of the Service of the First Regiment Michigan Engineers and Mechanics (Grand Rapids, Michigan: n.p., 1921). Available through google books. Growing up in the sixties we were not allowed to wear pants to school. I remember having to wear dresses or skirts to school through eighth grade at the public schools I attended. I have never really been overly fashion conscious and I don't remember specific outfits I wore as a child to school. I do remember having to throw pants in my school bag for outdoor recess in the winter. I imagine I had snow pants, too. Sunday dresses were different from my school dresses. I remember getting Cinderella dresses for Easter and then wearing that to church on Sunday. We had church shoes and school shoes. We didn't wear our black or white patent leather shoes to school. We wore school shoes and had to take a pair of tennis shoes for gym class. In the summer I remember wearing pedal pushers or shorts. The collar and trim on the shirt usually matched the bottoms. White bobby socks and tennis shoes were the norm. These were considered our play clothes. Winter play clothes consisted of knit pants, no jeans at that time for girls, and cotton button down blouses, or knit turtlenecks. I remember the first time I wore pants to school. I was sure I was going to be sent home. It was eighth grade picture day, 1971. Pant suits were in vogue and I had a very nice purple pant suit. It was a knit two piece. The belted top came down to upper thigh length. It had gold buttons on the shoulder. The bell bottomed pants matched the top exactly in color and material. I wanted to have my picture taken in that. So, I broke the rules and wore it for picture day. I worried all day that someone was going to say something, but no one did. I remember wanting wire-rimmed glasses so bad, but my mom said "No, only hippies wear wire rimmed glasses!" It wasn't long after that I got contacts! 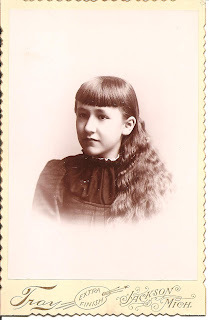 My grandmother, Daisy Graf Fredricks, grew up on a farm and lived most of her life on a farm. She use to make these dill pickles. Here is the recipe written as given to me. Mix all together and bring to a boil. Let boil for few minutes. Pour over pickles which have been washed. Put sprig of dill in bottom of jar. Pack pickles in jar with sprig of dill on top. Pour hot liquid over pickles and seal. This recipe is for quart jars. I haven't tried to make these as I don't can anymore. I did when I was first married. It seems easier to just buy it now. Although, nothing is better than fresh from the garden home canned food. 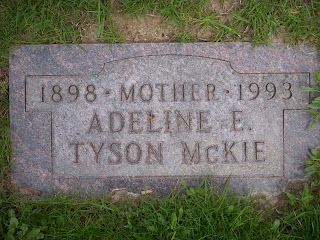 Last month, I wrote about my success with researching my maternal great grandfather's sisters and finding his mother. I am still trying to find what part of Prussia, now Poland, J. August Fredrick was from. 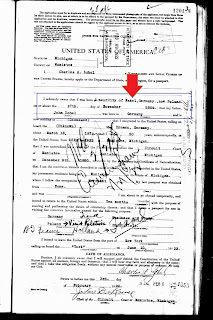 I continued my research into his oldest sister, Henriette Fredrich Zobel, and found a passport application for her son, Charles A. Zobel. 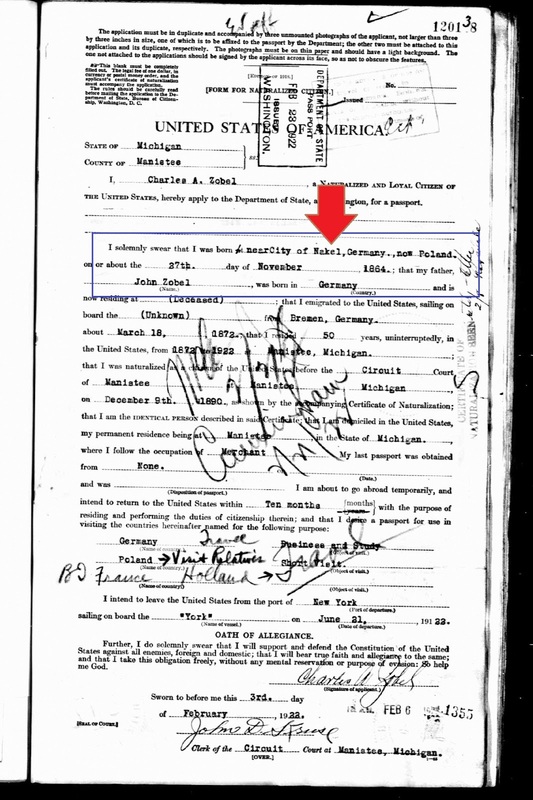 Charles A. Zobel applied for a U.S. passport in 1922 to travel and visit relatives in Germany and Poland. He lists his birthplace as: "near city of Nakel, Germany, now Poland". I had found his parent's, Johann Zobel and Henriette Fredrich, marriage place as Nakel, Poznan, Prussia. I guess I am wondering what the chance is of Henriette Fredrich living away from her family and if this could be the area my great grandfather is from. She was married in 1862; her son, Charles, was born in 1864. The Zobel family immigrated to the United States in 1870. 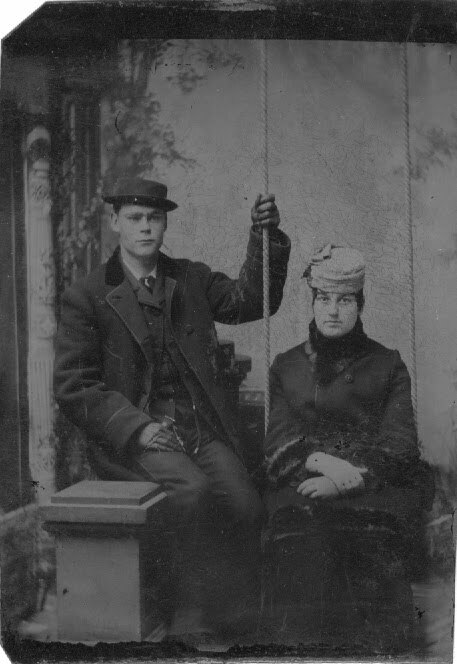 J. August Fredrich immigrated in 1872. Unfortunately, the immigration records have been destroyed for Manistee County (so I was told by a county clerk). I know the Zobel family and J. August's family were members of the German Lutheran Church in Manistee, Michigan. It may be time to take a look for Lutheran parish records for Nakel. What do you think? Any suggestions, where to go next? Happy Birthday, Great Grandma Glover! Week 23: Books-What was your favorite book, or who was your favorite author from your childhood? What do you like to read now? Books or other formats? For as long as I can remember I have loved to read. I remember the first time my dad took me to the library. I thought it was amazing. It was a tiny, little, white cottage-like building on Main Street, in Deckerville, Michigan. I was probably seven or eight at the time. There were rows of children's books I could choose from. I chose "If I Ran the Zoo" by Dr. Suess. I remember because I read the book while my Dad was looking for something. I checked it out and read it again and again. I liked the characters and the silly words he used in telling the story. Other Dr. Suess books I liked were "If I Ran A Circus" and "The Sleep Book". Later, I developed a love for "The Bobbsey Twins". I think I have read almost all of their books. By this time, we had moved to Harbor Beach, Michigan and I could ride my bike downtown to the library. The library was located in the Community Building, on Huron Avenue. The children's section was in the back corner. I would get three or four books at a time. In the summer I remember bringing home 8-10 books. I enjoyed getting books for birthdays and Christmas. My parents always let me get a book or two when the Scholastic book order came out, too. In Junior High, I received a book a month from a book club, I'm not sure what company that was with. I still have "If I Ran a Circus" and "The Sleep Book". They were well loved. I remember having Bobbsey Twins books as well. I am still an avid reader today. My tastes have developed from Dr. Suess to Bobbsey Twins to authors like Stuart Woods, Nora Roberts and Phillipa Gregory. I read mostly fiction, but every now and then I pick up a biography or a cookbook to read.